Can you help us identify the person in this image? We would like to speak to them after they were seen approaching a property in Green Lanes, Epsom at around 8.50pm on 21 March. The person’s face was covered at the time. We believe this incident may be linked to a previous burglary on the same road in December 2018. 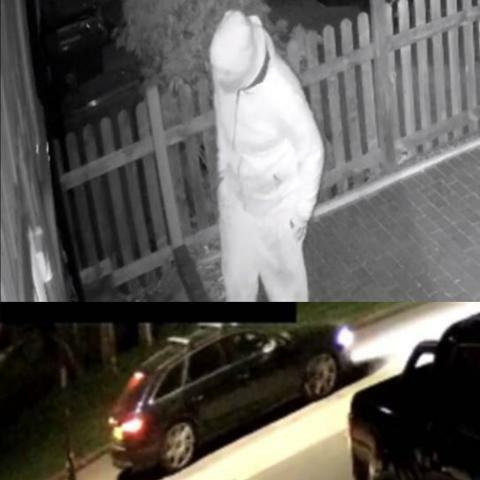 The person has left without gaining entry to the property and got into a vehicle which appears to be a dark-coloured Audi A3 Sportback, A4/S4 Avant estate car, or similar with a roof rack. If you have any information, including dashcam footage from the area at that time, please get in touch by calling us on 101 or report online (www.surreybe.at/2ev6r) and quoting reference number PR/45190030069. We would also like to hear from you if you have CCTV on your property and you live nearby. Alternatively, you can report anonymously by calling Crimestoppers on 0800 555 111, or reporting online (www.crimestoppers-uk.org).